Through a unique renewable energy system, University of Nebraska-Lincoln students and Lincoln residents help provide energy to heat and cool Nebraska Innovation Campus when they shower and flush. 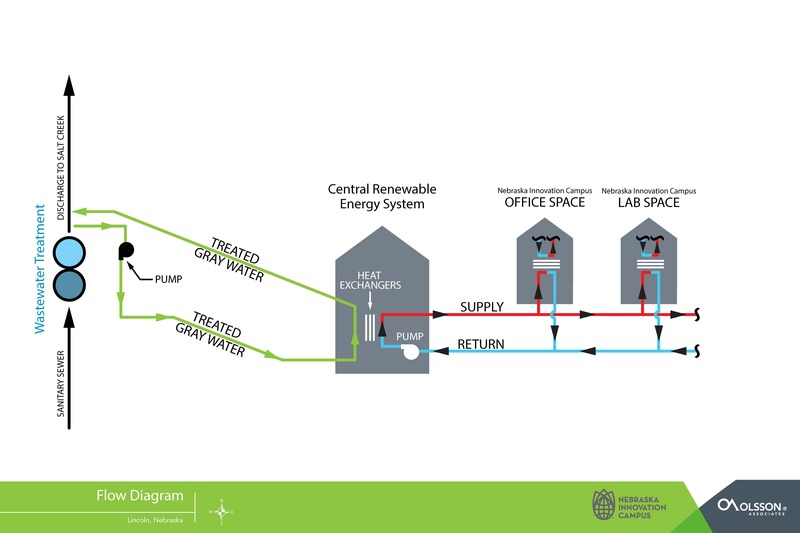 The Centralized Renewable Energy System, or CRES, warms and cools buildings by exchanging heat from treated wastewater discharged from a city facility next to the research park. Sustainable energy strategies are an important part of Nebraska Innovation Campus' value proposition, NIC executive director Dan Duncan said. "It's part of the culture we want to build at Innovation Campus," he said. "We need to do things differently and we need to think about things differently." Under construction on the former state fairgrounds near UNL's city campus, NIC is adjacent to the Theresa Street Wastewater Facility, which serves 70 percent of Lincoln, including nearly all of UNL. The facility releases treated effluent into Salt Creek, which runs along the north side of the campus. The designers of Nebraska Innovation Campus recognized the plant as a potential asset. They worked with city of Lincoln officials and state environmental officials to safely utilize the wastewater stream without harming Salt Creek. "Finding more sustainable ways to operate is a guiding principle at the city of Lincoln. This fits well with the culture at Innovation Campus, and the CRES project is a great example," said Lincoln Mayor Chris Beutler. "City and UNL staff worked together very closely to capture the renewable energy potential flowing through the neighboring wastewater plant, and I applaud everyone's creativity. The CRES is now an exciting 'can-do' model for other renewable energy efforts across the city." Duncan said a focus on environmental sustainability is part of fostering a collaborative and innovative atmosphere for the research park. The renewable energy system is a selling point for potential business tenants who want to reduce their carbon footprint. It also appeals to younger workers who aim to work for socially responsible companies. "This system is as innovative in concept and design as Nebraska Innovation Campus is in its emerging role in the global economy," UNL Chancellor Harvey Perlman said. "The university's partnership with the city of Lincoln was a key factor in this system becoming a reality." The idea to use wastewater for heating and cooling originated in early stages of campus planning. Alvine Engineering, an Omaha firm involved with developing the campus master plan, had worked on a similar concept for a Chicago office building that uses Chicago River water for its air conditioning cooling towers. "Everywhere you look, there's energy around you," said Doug Alvine, the firm's president. "Here's something that was just sitting there, water flowing into Salt Creek. Thousands of people see it every day. This little stream of water could provide a tremendous amount of energy to heat and cool Innovation Campus." Tetrad Property Group, the company developing phase I of the campus, worked with Olsson Associates to design the system. Designers said there are less than a dozen similar projects in the United States, with none quite like NIC's system. "The biggest challenge was the fact that there's no blueprint for something like this," said engineer David Roberts, a mechanical and electrical team leader for Olsson. "There are other projects out there that are similar, but nothing that's been done exactly like this before." The system serves as a geothermal ground loop that uses wastewater, instead of the ground, as its heat sink, Duncan said. The plant discharges effluent at up to 15,000 gallons per minute during daytime peaks. Water temperatures range from 57 to 75 degrees Fahrenheit, depending on the time of day and year. The effluent water is pumped from the plant's discharge point to a heat exchanger building on campus. There, it is used to heat or cool a second stream of water that circulates through a 6,000-foot loop of pipe through campus. On a typical summer day, it might cool the system water from 88 degrees to 78 degrees, creating 10 degrees of cooling for campus buildings. Initial infrastructure can serve up to about 1.1 million square feet of laboratory and office space, with additional expansion available later. The two streams circulate in self-contained loops so that the effluent is returned for discharge into Salt Creek without mixing with water that circulates through campus. An existing environmental permit prohibits water being discharged into the creek at more than 90 degrees. The system has been engineered so that the water will not exceed 85 degrees, Roberts said. The project cost $12 million, with construction and operating costs to be paid through tenant utility charges equivalent to existing electric and natural gas rates. It is expected to reduce heating costs by about 30 percent and cooling costs by about 25 percent compared to traditional systems in the long term. Tenants also will have more usable space in their buildings because they don't need bulky chillers and boilers. Roberts said a detailed load study showed the system generates the most energy when the most energy is needed. "It closely matches people's lifestyles," he said. "You wake up at 6 and take your shower and all the water starts coming to the plant. That's about the same time we're warming up or cooling down buildings to start the day."